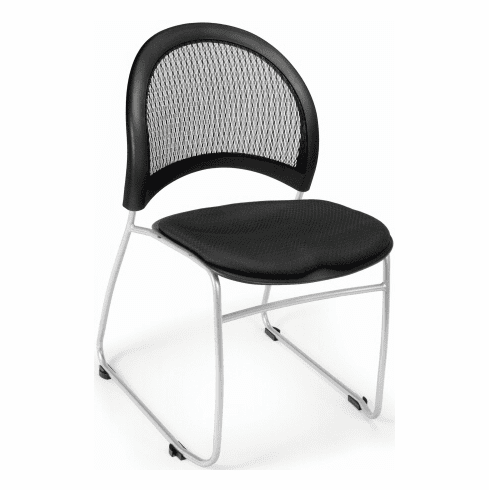 Half Moon Mesh Back Stacking Chairs  Free Shipping! These sled base stacking chairs from OFM feature a stylish crescent moon shaped mesh backrest for superior ventilation and support. Other features include built in lumbar support, contoured seat available in either a padded fabric or black plastic, tubular steel frame with silver powder coated finish and a sled base for easier mobility over carpet. Stackable up to (6) chairs high. Meets or exceeds ANSI/BIFMA standards. Dimensions: Seat Size: 18.5"W x 17.5"D. Back Size: 19"W x 15.5"H. Seat Height: 18.25"H. Overall: 32"H x 20.75"W x 23.5"D. Limited lifetime warranty from OFM. These stacking chairs normally ship in 1-2 business days from our NC warehouse.